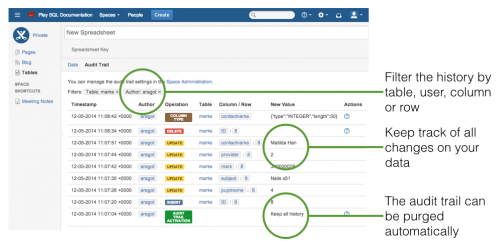 Play SQL Spreadsheets is an extension for the intranet tool named Atlassian Confluence. It lets users create a database schema in a friendly way and displays it like spreadsheets. Columns can be edited with rich formats, icons or formulas. Because it is seamlessly integrated in Atlassian Confluence, it makes the database accessible to non-power users. 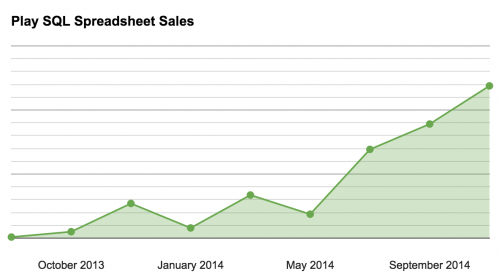 During the past year, you have made the customer base of Play SQL Spreadsheets. With your suggestions, requests and feedback from real life experience, you have contributed to the story of an Atlassian Marketplace plugin. I would like to celebrate this first year together with a retrospective of the new features we’ve built. I took over Play SQL in August 2013. At the time it was a read-only SQL client for Confluence. We thought about marketing the product as a database builder, or a build-a-database-inside-of-Confluence tool, but it didn’t quite capture the essence. We think people use Excel when they should really use a database, then they feel blocked by the inability to reference records between two tables. We think previous tools (MS Access, FileMaker) aren’t used much because of inconvenient user experience. We wanted to convey the power of the product through the name (“SQL”) together with the usage people made of it (“Spreadsheets”). So Play SQL Spreadsheets was born. Beyond the click-to-change-the-structure motto, the first good idea was to support copy-and-paste from Excel. The free add-on became “Play SQL Base” and remained read-only, with fewer features than the paid version. And we can now fill a column using a formula. Much useful for links between tables. The major revamp was the Query Editor. It benefited to both basic users, with wizards to write queries and joins, and to experienced users, with the SQL syntax coloration. The SQL editor was introduced in late 2013. The user parameters are used a lot. The history is now saved, and users can visualize modifications by people, row, column or spreadsheet. During the summer I had to work as a consultant for local clients, because the revenue from Play SQL Spreadsheet sales was limited. On the upside, I’m part of the rare elite who introduced an Atlassian Add-On and reached solid monthly sales in the first quarter. 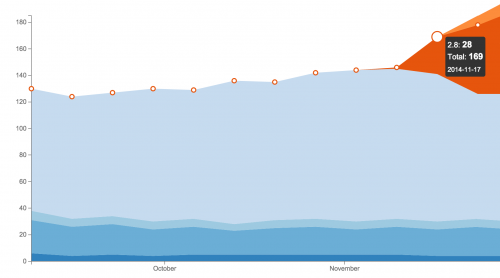 It improved a lot in September/October with major clients joining the momentum. I’m confident for 2015: On the one hand, the revenue is expected to be recurrent, thanks to customers like you, who can purchase one more year of upgrades for 50% of the original price. Given the 2014 track record of upgrades, there are good reasons for you to do so. On the other hand, the product was featured in a few Atlassian User Groups and blog posts, which strengthens the confidence in making a living off it in 2015, and therefore working full-time on it. It depends on you to spread positive comments on blogs, Twitter, Atlassian Answers, direct colleagues of yours and the Atlassian User Group of your city ! Please follow the Tweeter feed to share future news. Sales seem to grow stronger and I could almost hire someone, but it’s not confirmed yet whether they are solid or seasonal. Also, will customers purchase the maintenance license every year? A nice feature which funnels a lot of interest towards the Spreadsheets. It’s offered separately as an open-source plugin and adds up to the features of Play SQL Spreadsheets: It displays a single row of a spreadsheet as a form. Quite a unique feature among SQL clients: Users can use rich formats for query results. Everything can be displayed as Markdown (rich text), hyperlinks, icons, currency amounts and so on. We’re really heavy on “Making SQL databases accessible to normal people”, as all of this can be set up with click-and-play buttons. We’re conscious of how customers deploy the product and the next release is a Data Center qualification for Play SQL. It already provides caching, pagination and audit trail features for such users. A new administration tool is also coming for a specific task. It’s bad luck to make promises about features before we know how to implement them, so let’s keep it secret, like a teaser. “Data Center” is planned for the next week with cluster support. Start evaluating Play SQL today. Among other developments, the auto-filters were very appreciated, and probably a reason behind the sales soaring (see next chart). Atlassian runs weekly reports with the number of installed instances. Here is the user base for “Play SQL Base” soaring by 25% after the 2.8 release. It was less visible for Play SQL Spreadsheets, with tis 323 instances. Follow us on Twitter for monthly updates. This is our last letter before Christmas. We hope you’ve enjoyed this year of upgrades and you will join or promote our products in 2015. Happy new year to everyone !